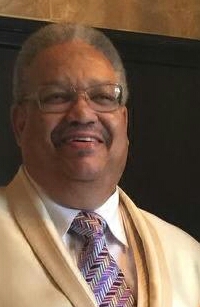 Donald Eugene Guilford, age 66. Sunrise November 3, 1949 and Sunset November 18, 2015. Donald graduated from Central High School, retired from Columbus Metropolitan Housing Authority and was an Independent Business Owner. He was a member of Higher Ground Always Abounding Assemblies where he served with the Deacon Ministry and President of the Pastors Aid Ministry. He was preceded in death by his parents John D. Stewart , Thelma “Dorothy” Clyborn, and Elista “Bobbie” Stewart and brothers John and Stacy Stewart. Left to cherish his memory wife Aleta Maria Guilford, children Asante’ SuJuan S. Guilford, Che’ Romere Guilford, Donald Balkcom Guilford, and Timothy Eugene Guilford, brothers Phillip (Kay) Bosley, Kenneth (Antonia) Stewart Sr., Alan Stewart and Lewis “Butch” (Silvia) Bernard, sisters Rochelle Stewart, Juanita (Julius Jr.) Magnum, Janice Jackson, Beverly Caldwell, Edwina Newman and Judy (John) Bowles and a host of other family and friends. Visitation 6:00pm and Funeral 7:00pm Tuesday November 24, 2015 at Higher Ground Always Abounding Assemblies 870 St. Clair Ave. Interment 10:00am Wednesday at Glen Rest Memorial Estates. Ministry of Comfort entrusted to MARLAN J. GARY FUNERAL HOME, THE CHAPEL OF PEACE 2500 Cleveland Ave.
Our prayers are with each of you. May the Peace of God give you comfort during this time and going forward. Brother Don will really be missed.